وجه العملة سيدة الحرية بقبعة و سلاح و الكلمات "تعال وخذه "
سيدة الحرية بقبعة و سلاح و الكلمات "تعال وخذه "
1 أوقية 2014 لقطعة فضية مضادة للخدوش لتعال وخذه The Come and Take It silver round is a merger of two previous designs in the Silver Shield series, AG-47 and Freedom Girl. This design carries a powerful message. It speaks of the willingness of people to stand up for what they believe in and to back up what they say. It echoes the words of the 2nd Amendment to the US Constitution and tells the world that freedom does not instigate violence, but if violence is necessary to preserve it then so be it. The obverse features the popular Freedom Girl from earlier designs in the series but she is different. This times she is wearing a hat and carrying a gun. Her face is still tranquil, but resolute. She is prepared, but certainly not eager. 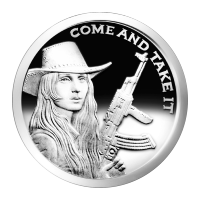 In the top right are the words "Come and Take It", much like the words from the AG-47 design. The reverse shows the revised Silver Shield logo with the trivium in the centre encircled by the words "Silver Shield 1 Troy ounce 2014 999 Pure AG" surrounded by 47 bullets.